If you have ever had impressions taken of your teeth at the dentist or orthodontist, you know how difficult and messy the process can be. That’s why if you need custom dental implants or a dental restoration in St. Albert, Dr. Lon Riemer helps lessen the discomfort and improve efficiency with digital impressions. We use a more convenient digital scanner that saves you from the sticky impression material in a tray, holding your jaw open waiting for it to harden over your teeth, and finally the uncomfortable suction when the tray is removed. Instead we offer the 3D intra-oral scanning technology of the iTero® digital laser scanner. To replace the traditional mould technique and materials, a handheld piece fits easily into your mouth to scan over 100,000 points of reference to create restorative crowns, bridges or implants. The 3-dimensional images of your teeth help create more accurately fitting restorations. You may also spend less time on dental appointments since digital impressions take less time per appointment and does away with return appointments to recheck previous impressions. During your appointment at the dentist in St. Albert, you can also immediately see the areas needing restorative work on a high-definition display. This helps facilitate a more in-depth chairside consultation with the dentist. The 3D display also provides real-time visualizations of the restorations for your damaged teeth since the iTero system is used for design and fabrication as well as scanning. A dental crown not only covers or caps a worn, weak or broken tooth. It also restores the tooth’s shape, size, strength and appearance. You may also need a crown to hold a dental bridge in place or to cover a dental implant. Dr. Lon Riemer begins the process of providing a natural looking and functional crown with digital impressions. With precise scanning, digital imaging allows for custom implant abutments to improve tooth stability and aesthetics. The iTero system also supports laboratory fabrication of restorative crowns, bridges, implant custom abutments, veneers, inlays, and onlays. The iTero scanner also works with any material, including resin, porcelain, porcelain fused to metal, zirconia, composite, and full gold. As of March 2016, iTero digital scans had been used for orthodontic impressions, making them more comfortable and less time-consuming. During your child’s regular dental exam, Dr. Riemer may find some problems with tooth position or development that can be corrected with an orthodontic appliance. In these cases, the technology of an intra-oral camera or the iTero scanner provides accurate, less invasive imaging. 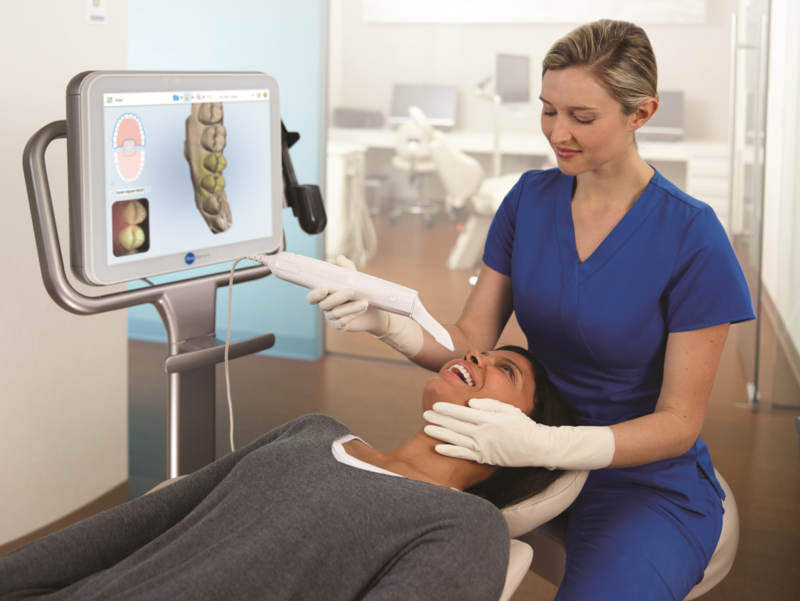 The iTero scanner can also be used to show you the predicted changes in tooth spacing and position. The digital images are easily stored and transferred when referring patients to orthodontists or transferring information to a laboratory. Why wait for digital imaging and a consultation to learn more about restorative dentistry or orthodontic appliances? Call us or request an appointment with our online form.